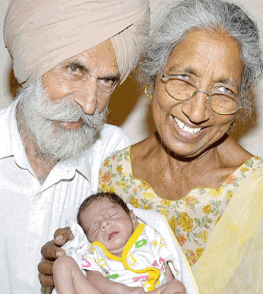 In 2016, an Indian woman named Daljinder Kaur and her husband Mohinder Gill became the world’s oldest set of first time parents at ages 72 and 79 respectively. Marla Ahlgrimm explains the birth was the result of two years of IVF treatment performed at the National Fertility and Test Tube Baby Centre in Haryana, India. According to women’s health expert Marla Ahlgrimm, Mrs. Kaur tried for five decades to conceive a child of her own, but with no luck. Though she was encouraged to adopt, Kaur claims she “knew” that she would one day have her own child. The son, born in April, is healthy despite concerns about the parents’ ages and the potential for health issues for the baby. Kaur visited the clinic first in 2013, says Marla Ahlgrimm. The birth was the third attempt at in-vitro; two prior attempts resulted in failed pregnancies. Dr. Anurag Bishnoi, who owns the fertility center, made headlines in 2006 after helping another senior conceive. Rajo Devi, like Kaur, was desperate for a baby and found success with Dr. Bishnoi at the age of 70. Marla Ahlgrimm says that advanced maternal age poses physical issues. There are currently no studies on the viability of pregnancy in women past the age of 70, as most women see an end to their childbearing years by their mid-50s. As a mother’s age advances, however, so does her risk of preeclampsia, kidney damage, and premature birth. Women aged 35 and older are considered advanced maternal age and are often advised to visit their doctor more often than a mother of 18 to 34.